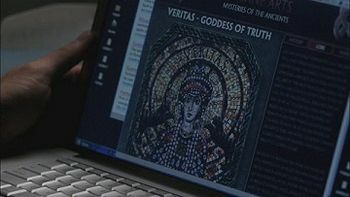 Veritas is the Roman goddess of truth. She made people say the truth so they would kill each other to pay her fee. Veritas is summoned by a young woman named Corey using a cat's skull, grains of paradise seed, and devil's shoestring, Corey having wanted to learn if her boyfriend was cheating on her. As a result of her summoning, anyone in her presence in Calumet City, Illinois who asks aloud for the truth invokes her curse. Veritas appeared as a young woman with long black hair. When threatened she shows partially her true form with cat-like eyes and two long sharp fangs. After being summoned to a location, anyone who asks aloud for the truth invokes her curse. When a person is cursed by Veritas, everyone he or she encounters has to speak the truth. Usually these truths are harsh and drive the person to commit suicide. She takes the bodies of her victims as tributes and feasts on them. She has cat-like speed and agility. Dogs are her Achilles' heel. She can force people to speak the truth to her. A knife dipped in dog's blood. When Dean arrives in town, he inadvertently invokes the curse and is suddenly bombarded by truths from everyone he encounters, including Lisa, who tells him over the phone that she and her son, Ben can no longer be involved in his life as a hunter. Sam and Dean learn that Veritas is in the city posing as an investigative reporter named Ashley Frank. She drives what appears to be a Jaguar E-Type or XK-E, a British automobile manufactured by Jaguar between 1961 and 1975, which is appropriate given her character's connection with cats. They go to her home to kill her, but she captures them and, before eating them, decides to play "Truth or Truth." She forces Dean to admit that he wanted to kill Sam in his sleep because he thought he was monster; however, when she questions Sam, she becomes agitated because she can tell that Sam is lying to her. She asks Sam what he is--he can't be human if he can lie to her. Sam and Dean use this distraction to free themselves and after Dean stabs her from behind with a meat hook, distracting her, Sam stabs her with a knife coated in dog's blood, killing her and breaking her curse. Veritas as she appears in lore. Veritas' human disguise, Ashley Frank. In Roman mythology, Veritas was the daughter of Saturn and Virtue. 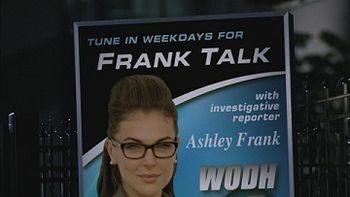 Serinda Swan previously played a hospital receptionist in 1.21 Salvation. This page was last edited on 17 July 2014, at 07:54.